Concluding National Poetry Month, Saturday Short features novelist, cartoonist, illustrator, playwright Lynda Barry on poetry—how it smells, how to write it, how to read it, how to remember it. She's great! My thanks to Poetry Foundation for the video. ✦ Earlier this month, CBS News visited San Antonio Museum of Art to talk about "Corita Kent and the Language of Pop", an exhibition of approximately 145 artworks by artist, educator, and Roman Catholic nun Corita Kent (1918-1986). On view through May 8, the exhibition was organized by Harvard Art Museums. See 15 of Rothshank's tiny paintings at Upworthy. ✦ Wheaton Arts and Cultural Center, Millville, New Jersey, has issued a call for artists in all media to apply for the Festival of Fine Craft, scheduled for October 1-2. Applications and deposits are due May 15; notification is June 1. ✦ The Manhattan Graphics Center, New York City, is offering an advanced printmakers class, "Collagraph and Mixed Media". Limited to eight students, the class will run from May 5 to June 2. The instructor is Robin Dintiman. View the list of other spring classes. ✦ Wood engraver Steven Lee-Davis, who apprenticed with Barry Moser, will be teaching "Wood Engraving: Well-Crafted Illustration", July 17-23, at Wells Book Arts Center, Aurora, New York. The class is part of a two-week Summer Institute. Read about Wells Book Arts Summer Institute (pdf). Registration is open currently. ✦ Today's video from Art21 features Sarah Sze talking about her 2015 work Measuring Stick by which she sought to measure time and space via moving image. ✭ New York City's Metropolitan Museum of Art continues "The Secret Life of Textiles: Plant Fibers" through July 31. The exhibition is the first in a series of three installations examining the uses, respectively, of plant, animal, and synthetic fibers. Linen, hemp, ramie, and cotton are looked at in depth in this show. Tickets are required. ✭ Maine's Portland Museum of Art is presenting rarely seen drawings, prints, watercolors, and photographs in "Masterworks on Paper: Highlights from the Portland Museum of Art". On view through June 5, the show features approximately 100 works by such artists as Chuck Close, Edward Hopper, Yvonne Jacquette, Roy Lichtenstein, Glenn Ligon, and Edward Manet. This is the first in the PMA's multi-year "Your Museum, Reimagined" project. The museum has issued its first collection catalogue, The Collection: Highlights from the Portland Museum of Art, that includes information about and images of several works in the show. ✭ The Museum of American Glass, part of Wheaton Arts and Cultural Center, Millville, New Jersey, is presenting "Raising Cane" through May 15. The exhibition explores how glass cane techniques (e.g., reticello, murrhine, latticino, milleflore) are used in contemporary art glass. Featured artists include Rick and Valerie Beck, Dave and Patti Hegland, Michael Hunter, Michael Maddy and Rina Fehrensen, Ralph Mossman and Mary Mullaney, Milissa Montini, David Pathen, Ken Schneidereit, Josh Simpson, Jeremy Sinkus, and Robert Wiener. ✭ A monumental site-specific installation by Daniel Arsham, on view in "The Future Was Then", can be seen through July 24 at SCAD Museum of Art, Savannah, Georgia. The exhibit also features Arsham's large installation Wall Excavation with which viewers may engage. ✭ On view at the University of Florida's Harn Museum of Art, Gainesville, Florida, is "Framing Nature: The Living World in Art". The show, which includes more than 100 drawings, prints, paintings, photographs, and sculptures, is organized thematically: "Inspiration", "Discovery", "Power", and "Refuge". Artists whose work is featured include Milton Avery, Elizabeth Blackwell, Jamini Roy, Sebastiao Salgado, Toshiko Takaezu, Maggy Taylor, and Edward Weston. A guide is available for families visiting the exhibition. A gallery talk, "Scientific Illustration: Aesthetics and Abstraction", is planned for June 12 at 3:00 p.m.
✭ The Paul Kasmin Gallery, New York City, has mounted "Robert Motherwell: The Art of Collage". On view through May 21, the exhibition is accompanied by a fully illustrated catalogue. Today, Thursday's Three presents a trio of upcoming art-and-poetry-related exhibitions. The show, at the foundation's Chicago headquarters, features a selection of silkscreened publicity posters created by University of Arizona students in the 1960s and 1970s as publicity for center readings. Among the poets for whom the now rare posters were created: Ai, Elizabeth Bishop, Robert Duncan, Lawrence Ferlinghetti, Denise Levertov, Gary Snyder, May Swenson. This is the first time the posters are being shown outside Tucson, according to the Poetry Foundation. Also, UA's Poetry Center and School of Art are presenting from May 2 to May 27 in the Jeremy Ingalls Gallery the "UA Student Contests Broadside Exhibition". ✭ In July, multidisciplinary artist Neha Vedpathak presents her "site-responsive" installation at the Poetry Foundation's Chicago headquarters. Vedpathak crafted her work using a pushpin in a process known as "plucking", which involved the repetitive, labor-intensive separation of fibers of Japanese handmade paper. For more about Vedpathak's technique, read "Plucking a Path from Painting to Sculpture" at Chicago Artists Resource. A video shows how she plucks. View Neha Vedpathak's portfolio of plucked papers. Watch the video "Neha Vedpatha: The Space Between". ✭ New York City's Poets House opens "Irish Poetry of the Twentieth Century: An Exhibition of Rare Books and Papers from Emory University" on May 4. The show will run through June 4. Today's video features work by the late poet and translator Lucien Stryk (1924-2013): "Memo to the Builder" and "You Must Change Your Life". The first is read by Suzanne Stryk and the second by the poet. Both poems can be found in And Still Birds Sing: New and Collected Poems (Swallow/Ohio University Press, 1998). The text also is at Red Eft Editions' Poetry and Painting blog. The paintings in the video are by Suzanne Stryk, Lucien Stryk's daughter-in-law. Suzanne's work was featured in my Artist Watch column at Escape Into Life on January 21, 2016. My thanks to Red Eft Editions, curated by Dan and Suzanne Stryk. Dan Stryk is himself a poet who has published more than a half-dozen collections, most recently Dimming Radiance: Poems and Prose Parables (Wind Publications, 2008) and Solace of the Aging Mare (Mid-America Press, 2008). His poems have appeared in numerous literary periodicals, including AGNI Online, Antioch Review, Ascent, The Cafe Review, Harvard Review Online, The Missouri Review, New England Review, Oxford American, Ploughshares, Poetry, Shenandoah, and Terrain. Dan's and Suzanne's lovely collaborations as well as guest features are posted to their blog. 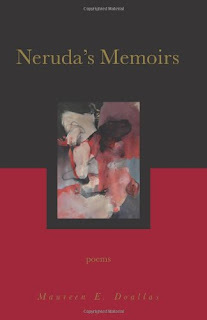 Today's poem is from Neruda's Memoirs: Poems (T.S. Poetry Press, 2011). of ravens' shimmery long-lined backs. the plaint of rain on fevered blades gone brown. making work of new life. It's a great platform to be an advocate for writing. 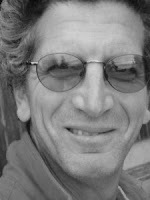 Stuart Kestenbaum has been appointed to the position of Maine Poet Laureate. The fifth poet to occupy the post, Kestenbaum succeeds Wesley McNair. His appointment is for five years. For information on the honorary, unpaid post and additional related resources, see my profile of Betsy Sholl. As Maine's state poet, Kestenbaum, who often gives readings and lectures on creativity and craft, aims to re-establish a Maine poetry festival and to celebrate the literary legacy of the state. He is quoted in a Blue Hill Peninsula Chamber of Commerce article as saying, "I'm so honored and grateful to have been selected. . . I hope to make connections between writers and other creative disciplines and to celebrate poetry's power to transform us—poet and reader alike—in unexpected ways." Former director of Haystack Mountain School of Crafts, writer and cultural project consultant Stuart Kestenbaum is the author of four poetry collections: Only Now (2014), Prayers and Run-on Sentences (2007), and House of Thanksgiving (2003), all three from Deerbrook Editions. He also is the author of Pilgrimage (Coyote Love Press, 1990), available through some resellers. Kestenbaum contributed the introduction to the 1985 anthology In High School I Believed That Poetry Existed Only to Make Me Feel Stupid, published by the Maine Department of Educational and Cultural Services. Kestenbaum, a Deer Isle resident, also is the author of The View from Here: Craft, Community, and the Creative Process (Brynmorgen Press, 2012) and editor of a collection of essays, Technology and the Hand: A Studio-based Symposium (Haystack Mountain, 2002); he is a co-author of Vision & Legacy: Celebrating the Architecture of Haystack (Brynmorgen Press, 2011). heartfelt responses to the privilege of having been given a life. life, pure life, set down with craft and love. Some subjects that run throughout Kestenbaum's elegantly written poetry, which can be humorous and often is deeply meditative, are time and its passage, memories, mortality, the natural world, and sense of place. Kestenbaum's poems have been read at The Writer's Almanac (see links in Resources below) and have appeared in numerous literary publications and magazines, including Beloit Poetry Journal, Maine The Magazine, Northeast Corridor, Persimmon, Soul-Lit, Sun magazine, Tikkun, and Verse Daily. Among the anthologies that include Kestenbaum's poems are Maine in Four Seasons: 20 Poets Celebrate the Turning Year (Down East Books, 2010), edited by Wesley McNair; The Maine Poets (Down East Books, 2003), edited by Wesley McNair; Good Poems for Hard Times (Penguin Books, 2005), selected by Garrison Keillor; Take Heart (Down East Books), edited by Wesley McNair; and Collection of Poems (Four Annual Terry Plunkett Maine Poetry Festival, University of Maine-Augusta, 2006). Among Kestenbaum's honors are a Distinguished Educator Award from James Renwick Alliance (2008) and Honorary Member of the Council (National Council on Education for the Ceramic Arts), the latter awarded in March 2016 at the council's annual conference. Kestenbaum also is an Honorary Fellow of American Craft Council. In 2016, he was a visiting writer at Alfred Ceramics, where he presented a talk about creativity, making, the writing process, and his own work. In 2015, he was named one of "50 Mainers Boldly Leading Our State" by Maine The Magazine. 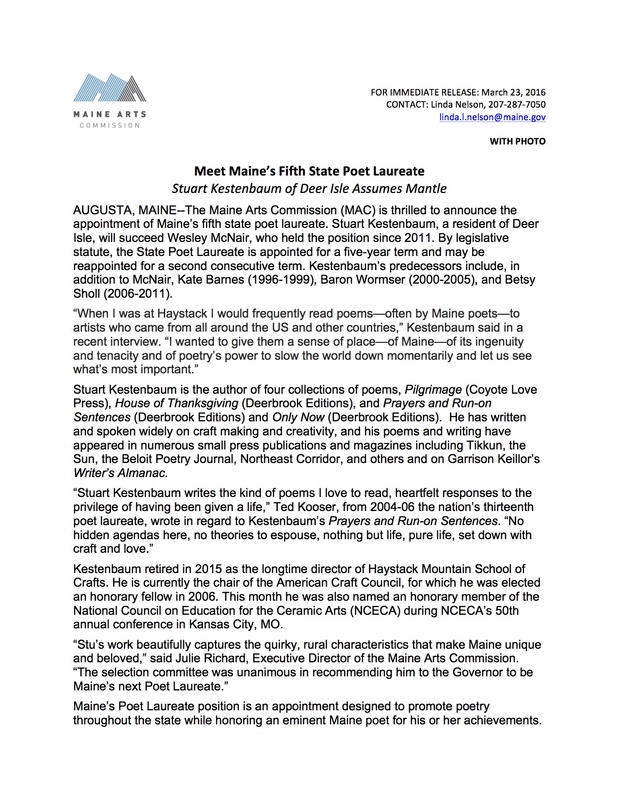 ** Ted Kooser's opinion of Kestenbaum's poetry is quoted widely, including in Maine Arts Commission's news release; Letitia Baldwin's article "Stu Kestenbaum Named Maine Poet Laureate", Ellsworth American, March 24, 2016; and Penn State News, October 5, 2015. Kestenbaum's poem "Prayer for the Dead" was written for his brother Howard Kestenbaum, who died in the terrorist attacks of 9/11. Kestenbaum's poem "In Praise of Hands" is a broadside created in 2008 in an edition of 100 by Carolee Campbell. Kestenbaum's poem "Grief Arrives" appears in Jan Owen's artist book Requiem (2009). The McNair anthologies, Take Heart: Poems from Maine (2013) and Take Heart: More Poems from Maine (2016), are at Amazon. Kestenbaum's poems appear in various editions. The books are available from Down East Books. A good writing quote from Kestenbaum at the Visit Maine site: "Spending time with people who work with physical materials and figure thing out, I began to see words as a material, too, and understand that any kind of creating is a relationship between the maker and the material. Editing is working with those materials, building a structure. If I make a mistake, it doesn't mean I have to crumple up the paper. I can learn to listen to the words and continue the shaping." Ninja Press Broadside of Stuart Kestenbaum's "In Praise of Hands"
Hayes's most recent collection is How to Be Drawn (Penguin Books, 2015), which was a finalist in 2015 for a National Book Award and National Book Critics Circle Award. Lighthead won the 2010 National Book Award for Poetry. Today's short is the trailer for NOVA's "Can Alzheimer's Be Stopped? ", a look at current efforts to identify what causes Alzheimer's disease and what is needed to find a cure. The film, which was broadcast on PBS on April 13, is available as a DVD. Also see "Could Virus -Like Proteins Be Causing Alzheimer's?" Read Greg O'Brien's feature, "I'm Documenting My Own Alzheimer's Disease While I Still Can", The Washington Post, April 13, 2016. 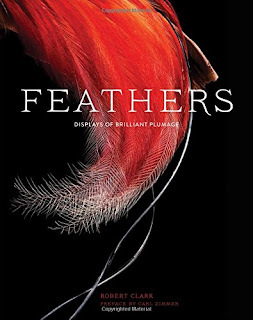 ✦ New York City-based freelance photographer Robert Clark, who was an award-winning shooter for National Geographic, has published a book of marvels: Feathers: Displays of Brilliant Plumage (Chronicle Books, April 2, 2016). View a selection of feather images from the book on Clark's Website. Clark's other books include Evolution, Friday Night Lights, First Down Houston, and Cell Phone. Clark offers for purchase a selection of signed ink jet prints from his Feathers series. Among them is his book's cover image. ✦ View a remarkable series of cut paper sculptures of athletes by Raya Sader Bujana (Barcelona, Spain) at All Things Paper blog, curated by my friend, paper artist Ann Martin. 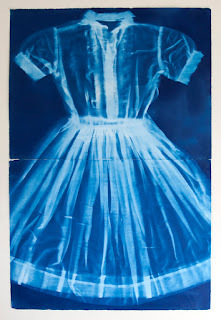 Cyanotype on Paper, 52" x 40"
✦ Save the Dates! The "Communicating the Museum" conference in Berlin is scheduled for July 13-15. Its other dates: November 15-17, Quebec; and March 2017, Paris. ✦ South African photographer Gideon Mendel is the first recipient of a new arts prize, the Pollock Prize for Creativity. The award will be given yearly. Read the press release from the Pollock-Krasner Foundation. ✭ Painter and MacArthur "Genius" Kerry James Marshall is the subject of a retrospective, "Mastry", opening tomorrow at Chicago's Museum of Contemporary Art. The exhibition, which will continue through September 25, showcases paintings made over the last 35 years. Accompanying the show is a 320-page monograph with essays by the curators and Marshall himself. The exhibition will travel to The Metropolitan Museum of Art, New York City, in October, and to the Museum of Contemporary Art, Los Angeles, in March 2017. Fourteen images may be viewed at the exhibition link above. ✭ The Cincinnati Art Museum continues through May 8 "The Etching Revival from Daubigny to Twachtman". Included in the exhibition, which examines the etching process and includes a wood etching press from the early 1900s as well as plates and tools to create etchings, are works by Charles-Francois Daubigny, Camille Corot, Jean-Francoise Millet, and James McNeil Whistler, as well as practitioners with ties to Cincinnati, including Mary Louise McLaughlin, Henry Farny, Lewis Henry Meakin, and John Twachtman. More than 100 monochromatic prints are on view. Download The Etching Revival Guide (pdf), which includes an explanation of etching terms. ✭ In a survey of 20 works, 2003 to the present, Dallas Museum of Art explores a decade of sculptural innovations — in practice, style, and materials —by British artist Rebecca Warren. The exhibition, "Rebecca Warren: The Main Feeling", continues through July 17. View images at the exhibition link. DMA is the first museum in the United States to commission a sculpture from Warren: Pas des Deux (Plaza Monument), sited on the museum's newly opened Eagle Family Plaza. ✭ Washington, D.C.'s National Gallery of Art is presenting through May 15 "Louise Bourgeois: No Exit". An exploration of Bourgeois's ties to the surrealists and existentialists, the exhibition of 21 of the artist's drawings, prints, and sculptures also includes an unbound book, He Disappeared into Complete Silence (1947), which contains nine engravings and nine parables; the marble sculpture Germinal (1967), and M is for Mother (1998), a drawing. 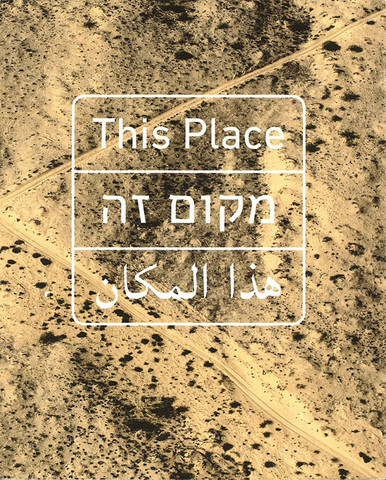 ✭ In "This Place", on view through June 5, Brooklyn Museum of Art examines through the eyes of 12 international photographers Israel and the West Bank as place and as metaphor. The show presents more 600 images, taken between 2009 and 2012, by Frederic Brenner, Wendy Ewald, Martin Kollar, Josef Koudelka, Jungjin Lee, Gilles Peress, Fazal Sheikh, Stephen Shore, Rosalind Fox Solomon, Thomas Struth, Jeff Wall, and Nick Waplington. View a selection of images at the exhibition link above. Visit the "This Place" Website. Gallery tours are scheduled for April 24 and 28; a talk with Wendy Ewald, "Three Perspectives", takes place with Luc Sante on May 1; and a two-part film series, Wherever You Go and Red Leaves, is offered June 5. An illustrated catalogue is available. 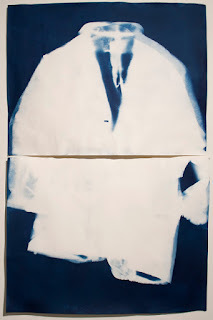 Join me today at Escape Into Life, where I'm showcasing in Artist Watch a selection of cyanotypes* by Lucy Capehart. A photographer and museum professional, Lucy lives and works in Portland, Oregon. Her work is in a number of photographic collections and has appeared on the covers of books and CDs. 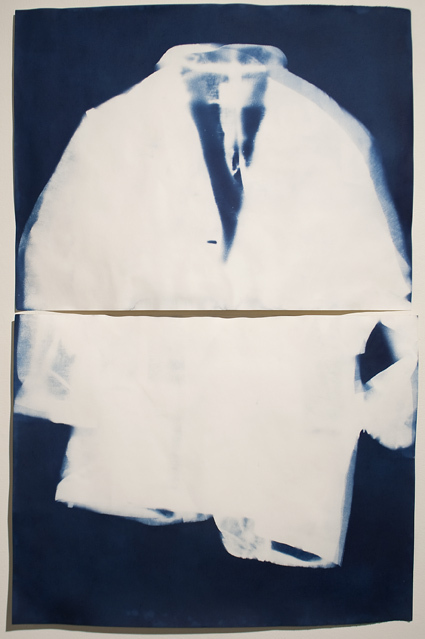 Today's Artist Watch feature includes eight images of Lucy's cyanotypes, her Artist Statement, which relates the poignant back story about the images; a brief biography, and social media sites. * The Getty has prepared and made available online an informative brochure about cyanotypes (pdf) that includes historical background, information about the process, and visual characteristics. oil, give it a chance. In his poem "Love's Last"*, Christian Wiman writes, "Love's last urgency is earth / and grief is all gravity". This couplet resounded as I read Megan Willome's newly published The Joy of Poetry (T.S. Poetry Press), a hybrid book that is both a memoir and an accounting of the kinds of love that abide and are sustained, sometimes with great effort. Not the least of these is Willome's love of poetry and her often intentional practice of it: the ways it grounds her, brings laughter, instructs her, accompanies her over years-long periods interrupted by the usual activities of life that join past to present. Anchoring The Joy of Poetry is Willome's story of her relationship with her mother, Merry Nell Drummond, who lived for more than two decades with the cancer that eventually took her life. Willome's grief is all gravity — it is this memoir portion of the book that Willome skillfully threads through each chapter, keeping the narrative focused but never mired in unnecessary explication or detail, or the too-personal. But this book is no downer. Perhaps paradoxically, grief also gives Willome reason to relate her palpable sense of loss to a pronounced sense of joy — joy that comes with remembering how, because of Merry Nell, Willome became a published poet at age 13 and, some 30 years after, is still reading, writing, and collecting poems: practicing poetry for the joy of it. To this reader, it is no surprise that Willome credits her experience with and of poetry to "literally chang[ing] my attitude" and saving her life. She herself asserts these facts early on, even as she acknowledges that "most people, even most writers, aren't like me. A lot are. . . afraid of poetry." Helping others get over that fear is another path to joy. Whatever their lierary background may be, readers also are apt to come across at least a few familiar names (Dana Gioia, Luci Shaw, Ann Patchett) and new names— all serendipitous finds. I did. I was unfamiliar with a number of the poets Willome quotes: Katherine E. McGhee, Helena Nelson, Kim Dower, Karla Kuskin, Kathleen Jamie. Willome's selection and inclusion of these writers diversify and broaden the poetry landscape, giving us voices we otherwise might never have heard. One of the author's best ideas is to become someone's "poetry buddy"; Willome's was a person admittedly "askeerd" [afraid] of poetry who ended up reading and sharing four months of thoughts about Kevin Young's Book of Hours. Other excellent recommendations are to "do a poetry dare", either alone or as part of a larger community devoted to expanding poetry awareness and appreciation generally; keep a notebook of brief thoughts about the poems one reads, at whatever pace (the notebook also could be used to copy out poems, helping one to better understand how poems are written); and create a scrapbook of poems just because you like a poet's style, vocabulary, or insights. The latter might comprise one's initial and subsequent efforts at poetry writing, funny poems clipped from magazines, poems of consolation, special-occasion poems, poems of remembrance, or, as in Willome's case, any poems that you just want to keep by your side, for any reason or no reason at all — you don't have to answer the question, "Why?" The many poems the author includes in The Joy of Poetry could be among the first you decide to safe-keep. Willome's The Joy of Poetry is part of T.S. 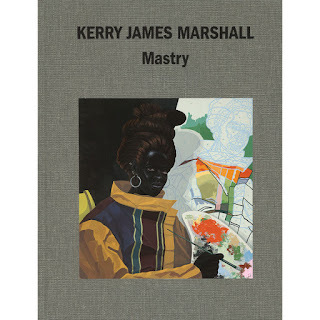 Poetry Press's "Masters in Fine Living Series", which is conceived as a holistic approach to "living deeply, richly" by showing us how to mine the possibilities opened to us through reading, writing, playing, learning, and growing. It is available in e-book and print editions, as all titles in the series are. NOTE: The book club at Tweetspeak Poetry has selected The Joy of Poetry for its next discussion, beginning May 4. The very able LW Lindquist will act as leader and guide. Anyone may join in. 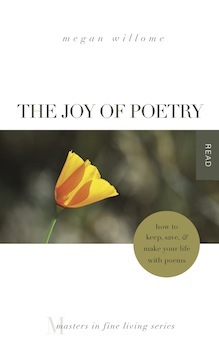 For details, see "Book Club Announcement: The Joy of Poetry Begins May 4". Today's poem is from Neruda's Memoirs: Poems (T.S. Poetry, 2011). our state's communities. . . and reflect upon their strength. Native American Elizabeth Woody, a member of the Confederated Tribes of Warm Springs (Navajo), is Oregon's eighth Poet Laureate. Successor to Peter Sears, Woody officially takes up her two-year post on April 27. For information about the history and responsibilities of the position, see my post about Lawson Fusao Inada (2006-2010). Described as a vivid storyteller, Woody, a lecturer and educator, will give up to 20 poetry readings throughout the state during her term of service. Woody contributed the introduction to E.K. Caldwell's Dreaming the Dawn: Conversations with Native Artists and Activists (University of Nebraska Press, 1999). She is co-author of Harry Fonseca Earth Wind and Fire (Wheelright Museum of the American Indian, 1996; out of print). With Gloria Bird, Woody co-authored the introduction to Dancing on the Rim of the World (University of Arizona Press, 1990). Among the books Woody has illustrated is Sherman Alexi's Old Shirts and New Skins (American Indian Studies, 1993; see GoogleBooks). She exhibits her artwork regionally and nationally. Place, both specific and regional, is central to Woody's poetry, as is family. In Luminaries of the Humble, Woody draws on her experiences in the Pacific Northwest, her understanding of the natural environment, misinterpretations of Native culture, contemporary issues such as domestic violence and alcoholism, homelessness and crime, and personal history, including her development as a poet. Reviewer Judy Elsley describes Woody as a practitioner of "ethnopoetics, writing a bridge of sympathy and understanding between her own people and the non-native American reader." Inside taste is a dark definition of light. The drum is the garment for speech. Intoxicated on the breath. No breath on collapsing. A number of Woody's poems, including "Coma" and "Flight", are in Frontiers: A Journal of Women Studies (Vol. 23, No. 2, 2002; see excerpts above) and three, "Girlfriends", "Perfidy", and "Straight and Clear", can be found in Ploughshares (Spring 1994). Woody's poem "Cedar and Salmon" is included in Readings in the Poetry Garden (West Hollywood Lannan, 1994), along with several poems by Sherman Alexie. Woody's poetry as well as essays appear in many anthologies, including Reinventing the Enemy's Language: Contemporary Native Women's Writings of North America (W.W. Norton, 1998), edited by Gloria Bird and Joy Harjo; Speaking for the Generations: Native Writers on Writing (University of Arizona Press, 1997), edited by Simon J. Ortiz; Returning the Gift: Poetry and Prose from the First North American Native Writers' Festival (University of Arizona Press, 1994), and Songs from This Earth on Turtle's Back: Contemporary American Indian Poetry (The Greenfield Review Press, 1983). (View anthologies list.) An interview with Woody is included in Norma C. Wilson's The Nature of Native American Poetry (University of New Mexico Press, 2000). Among the honors that Woody has received are the William Stafford Memorial Award for Poetry (Pacific Northwest Bookseller's Association, 1995), a "Medicine Pathways for the Future" fellowship from the Kellogg Foundation (via American Indian Ambassadors Program of Americans for Indian Opportunity, 1993), and a J.T. Stewart Award and Fellowship (Hedgebrook, 1997). In addition, she was awarded a residency by San Francisco's Intersection for the Arts (1997). A finalist for a 1995 Oregon Book Award, Woody has been a featured poet at the Geraldine R. Dodge Poetry Festival. She is a founding member of Northwest Native American Writers Association and a member of the board of the women's writing retreat Soapstone. 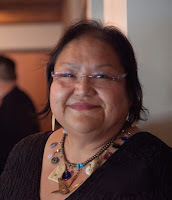 Read Elizabeth Woody's poems "Flight", "Walk" (excerpt), and "June in Red Willow and Cottonwoods" in Tea and Bannock Stories: First Nations Community of Poetic Voices, Simon Fraser University (pdf). Listen to Woody's readings from Mountain Writers Series (2010) and Summer Fishtrap (1990) at Oregon Poetic Voices. Faithful To Continuance: Legacy of the Plateau People from Mimbres Fever Productions on Vimeo.